The scandal involving the former Minister of State in the Ministry of Immigration and Nationality Elvin Penner is heating up again. Attorney Arthur Saldivar disclosed on Monday October 7th that 150 nationality applications were leaked out from the Immigration and Nationality Department and shows that the embattled Penner processed and signed all applications and they all contained inconsistencies. The latest revelation came on the deadline set by the People’s United Party (PUP) for Penner to resign or face recall. On October 2nd, the Opposition PUP’s Party Leader, Francis Fonseca wrote to Penner advising him to resign as standard Bearer for Cayo North East by Monday October 7th, or face a recall by his constituency. “If you fail to resign…by 5PM on Monday October 7th, the PUP along with the electors of that division will initiate your recall as the Divisional Representative of Cayo North East Electoral Division in accordance with the Recall of Elected Representatives Act No. 20 of 2010” wrote Fonseca. 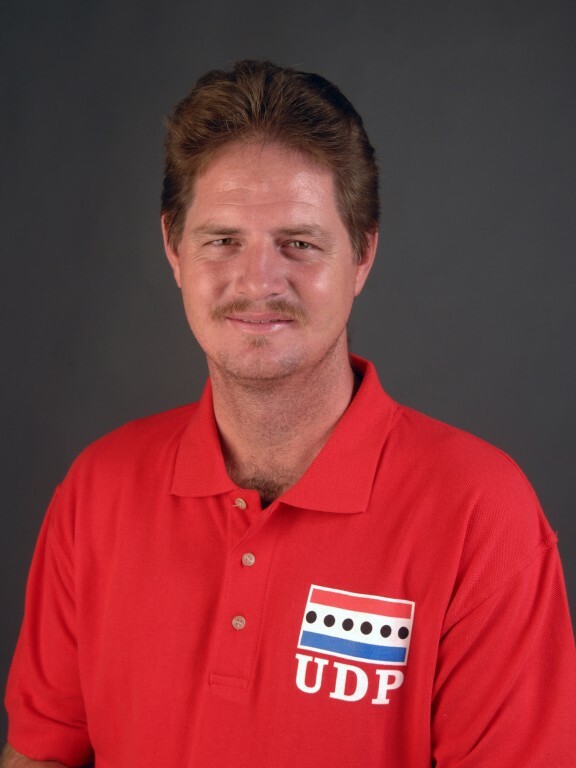 But Penner did not resign, and in an interview with the media on October 4th, Prime Minster of Belize and Party Leader of the United Democratic Party (UDP) Dean Barrow said that his party will stand behind Penner and fight the recall process. “The party will rally around Elvin Penner. We believe that he deserves a second chance. We believe that we ought to help him persuade his constituents not to recall him. If the constituents decide otherwise, so be it,” said Barrow. But even before the deadline set by their Party Leader, the PUP jumped into action and on the weekend of October 5th and 6th, held events to collect the 1800 signatures (30%) of registered voters in the Cayo North East to trigger the recall process. Just as the UDP was gearing up their defensive plan to counter the recall campaign launched by the PUP, the heat blazed into fire when allegations were made that Penner was involved in the processing and signing of more documents; 150 nationality certificates to be exact. That announcement was made by PUP political aspirant and attorney Arthur Saldivar during a conference on Monday October 7th. “These are not allegations or accusations; we have facts. We have original documents showing that the Ministry of Immigration presently is undergoing a purging of files—a systematic and deliberate destruction of files that were signed by Elvin Penner in his tenure as Minister of State with responsibility for immigration. This is presently ongoing. In fact, as recently as yesterday, a group of four young men—not associated with the immigration department—were actively burning hundreds upon hundreds of files. We were able to put our hands—and I say we, because myself and my associates were able to put our hands—on a hundred and fifty files. And we will be releasing these files in a timely manner until the immigration department; its nationality section, its passport section is closed down effectively for a complete and comprehensive investigation of what is taking place,” said Saldivar. Saldivar revealed the first of 150 nationality certificates that will be shared over time. 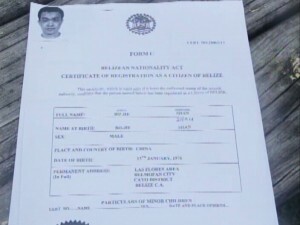 He provided the media with a copy of nationality documents showing that a 37 year old man, born in China and who gives his address as Las Flores area of Belmopan, was processed and granted Belizean nationality by Penner. 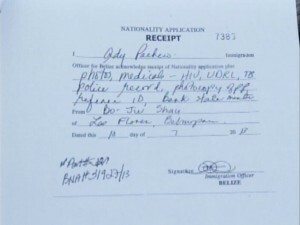 His name is Bo-Jie Shan and his nationality certificate was issued in May of 2013, but the receipt for his application wasn’t issued by Immigration Officer Ady Pacheco until July of 2013. 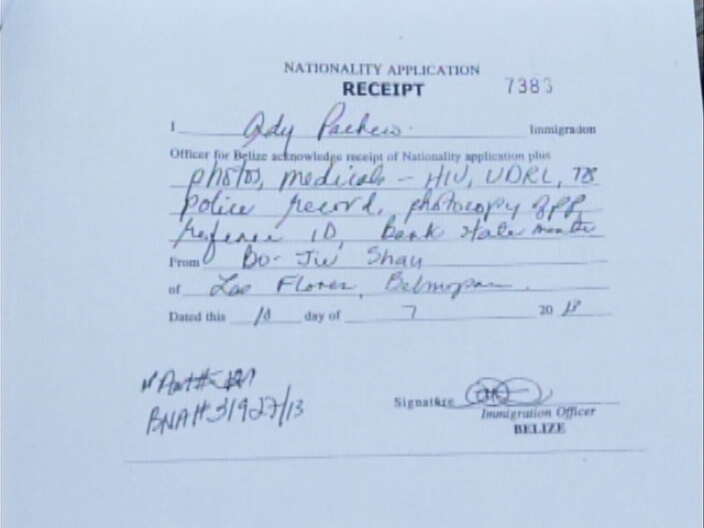 According to Saldivar, Shan’s document is just one of 150 nationality files he obtained that show irregularities in the application process for Asians, Pakistanis, Middle-Eastern citizens and even a Guatemalan governor. The entire passport and nationality scandal began unfolding on September 19th after it was revealed that Penner facilitated the nationality and a Belizean passport for South Korean National, Kim Won Hong for US $120,000. 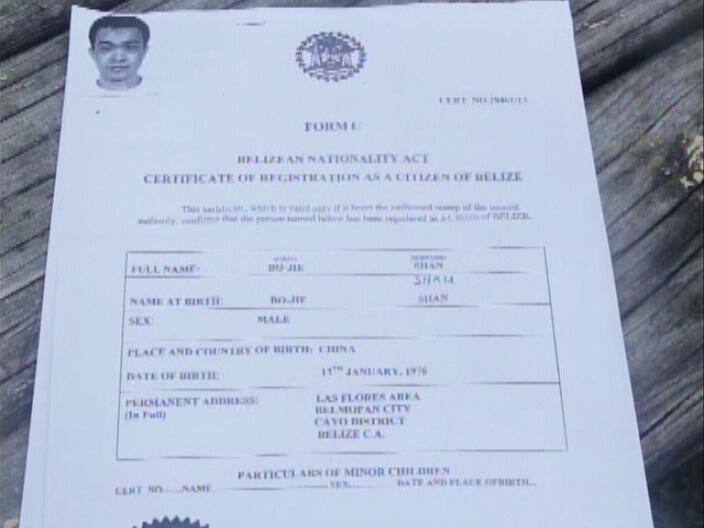 Penner claimed he brought in Hong personally into the Belize Passport Office to have his passport application processed in one day. However at the time Penner claimed he processed and granted Hong his passport, the applicant was in a prison in Taipei, Taiwan. Hong has been in prison since July 13, 2013 but was extradited to South Korea where he is under investigation for embezzling million of dollars from a company. Since the incident, Penner was fired from Cabinet by PM Barrow, but Belizeans have been clamoring for a criminal investigation. However, there have also been accusations made against PM Barrow by various organizations, claiming that the PM is “intimidating the justice system.” These sentiments were aired after PM Barrow publicly commented regarding the criminality of the passport issue involving Penner. “I think that he has been properly punished for his role in the incident but I also said, both as a lawyer and as head of the government, I looked at the circumstances as closely and as fairly and as critically as I could, and I am satisfied that there is no basis on which any criminal charges could successfully be laid. There is no evidence at all that could sustain a criminal prosecution against Penner,” said PM Barrow. But even as PM Barrow said there is nothing that can stand in court, two Belizeans, well known media personality Mose Hyde of Belize City, and law student Marlon Robinson of the Cayo District, have visited the police department to personally press charges against Penner so that a criminal investigation can be launched. According to the Office of the Director of Public Prosecution (DPP), there is enough evidence that warrants the police to initiate a criminal investigation. For her part the Director of the Financial Intelligence Unit (FIU) Marilyn Williams, told the press on Monday October 7th that since there are allegations of a large amount of money being involved, the FIU launched an investigation. “The FIU, based on the laws under which they are mandated, have already started the process of an investigation. Unfortunately I am not in a position to give any details whatsoever. The type of investigation that we do must be done - I wouldn’t say in private but certainly not open for public discussion,” said Williams. However, despite the two Belizeans who have visited the police to press charges against Penner and the fact that both the FIU and DPP office indicated that there is enough information that warrants a criminal investigation, the Belize Police Department has yet to initiate one. “I was out of office, so I can’t comment,” said Commissioner of Police Allen Whylie. “I need to get in office to see what has been said, what has been submitted to me before I could say something.” Whylie explained that he has not heard anything since his home has no access to radio and television news. There has been no reaction from PM Barrow nor the Immigration and Nationality Department regarding the recent revelation made by Saldivar or the accusation that documents are being destroyed to further protect Penner. Nonetheless, the PUP is adding pressure as the passport and nationality scandal continues to unravel. If the PUP is successful in obtaining the 1800 signatures required for Penner to be recalled, the process would be historic for two reasons. Firstly the recall act was introduced by the ruling UDP government in 2010 and as such is being tested while they are in government, and secondly because it is the first time that such a process is being held in Belize while a government has a very slim majority in the House of Representative. The San Pedro Sun will continue following up on any further developments.